useful plugin that allows you to synchronize your Vtiger and Google Calendar. The main advantage is option to map each Activity type (also custom) to different Google Calendar. Map Meeting into first Google Calendar called Meeting, Call into second Calendar called Call and Mobile Call into next Google Calendar called Mobile Call. Do you have Meeting? 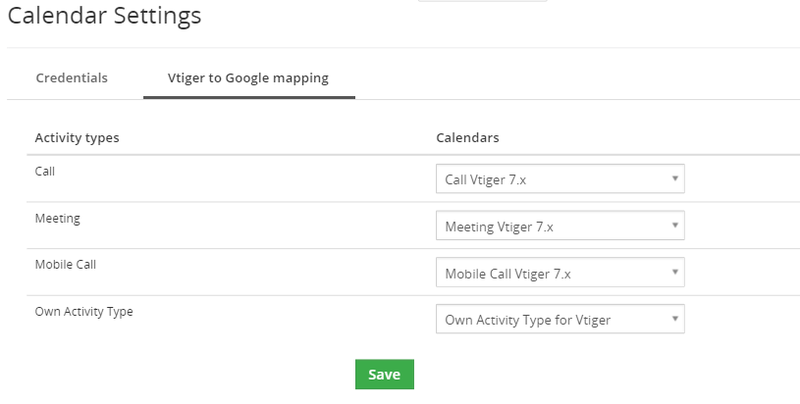 Create record in Meeting Google Calendar and in Vtiger your Event has Activity type Meeting. Do you have Call? Create record with Call Activity type and you will see record in Call Google Calendar. Synchronization is automatically and regularly executed by Cron. Forget about the need to synchronize manually after each record creation or change. With membership/subscription you will have access to latest versions of extension for Vtiger version 6.x, 7.x ( and higher). Google Calendar Synchronize stop working and synchronizing if you do not renew subscription. Duration of subscription is 1 Year.